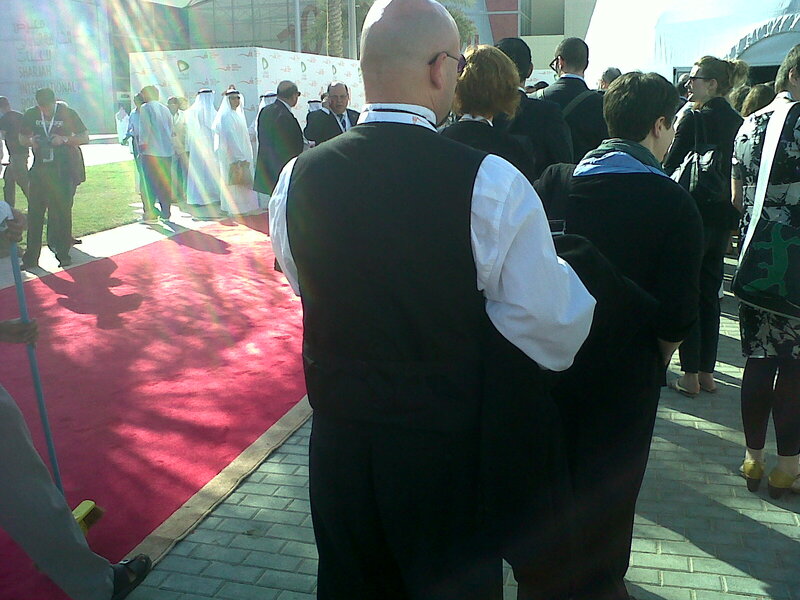 SHJIBF Opening Ceremony | Que Sera Sara? This morning, the Sharjah International Book Fair was opened to the public. 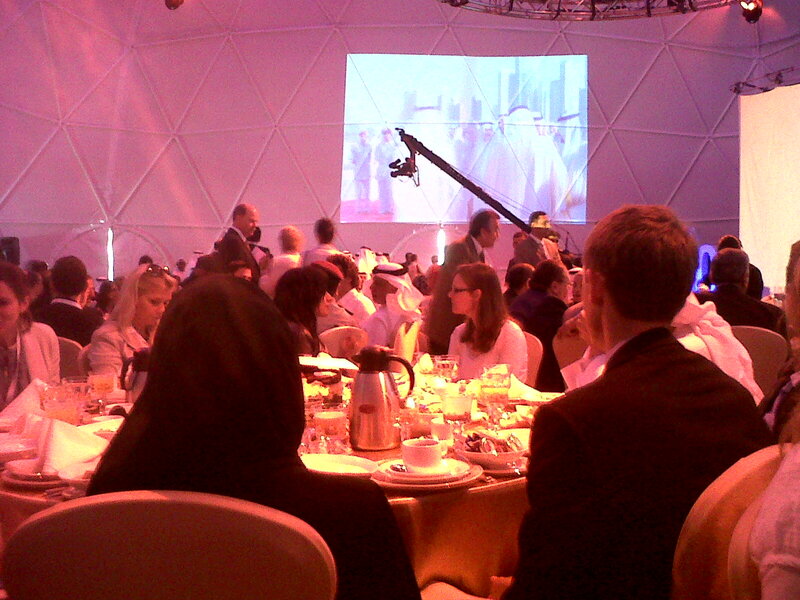 An opening brunch of incredible decadence, attended by Culture Ministers, Ambassadors, literary professionals and government agencies, hosted by His Highness Dr. Sheikh Sultan Bin Mohammad Al Qasimi, Member of the Supreme Council of United Arab Emirates and Ruler of Sharjah, and patron of this Fair. An inaugural celebration for the fair’s 30th anniversary – including the unveiling of the $300,000 translation prize I mentioned and the cultural programme, consisting of 30 Arabic writers and 30 international writers in discussions throughout the fair. The launch of the Sultan’s own book – about the last 30 years of cultural development in this country – timely, considering Sharjah is the OIC City of Islamic Culture in 2014. There were many speeches [with simul-cast translation headsets. It felt like I was in the UN] including profuse thanks and offerings and gifts. A golden camel [statue] was even proffered to the Sultan. There were mountains of food [though the moody light effects don’t do it justice below] – there was literally not an inch of our 10-seater that wasn’t covered in feastly delectables. I especially liked the soft, puffy naan-like bread rounds, slathered in honey and fennel seeds. A sort of Middle Eastern french toast & maple syrup. The whole event was amazing. Sadly I did not witness the hydraulic throne I heard about from last year but some awesome sights were had nonetheless. 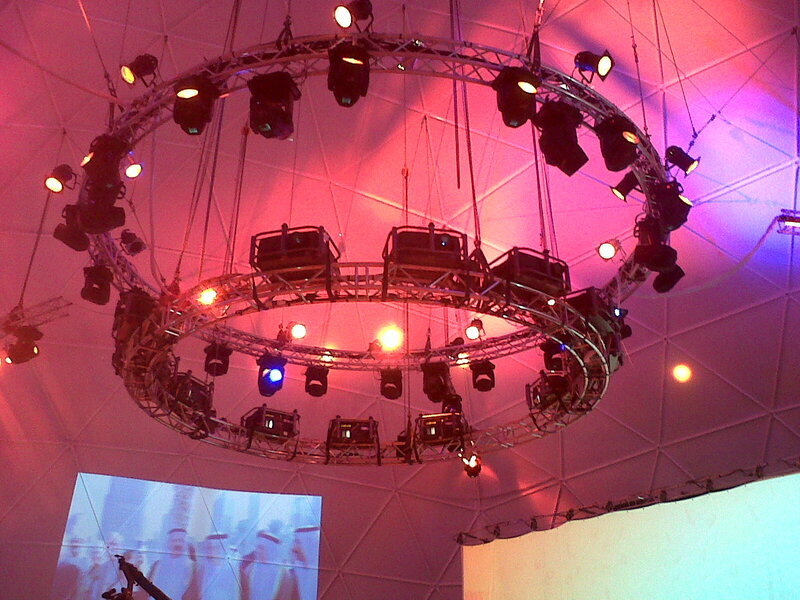 It helped that the venue was kitted out like a rock palace. 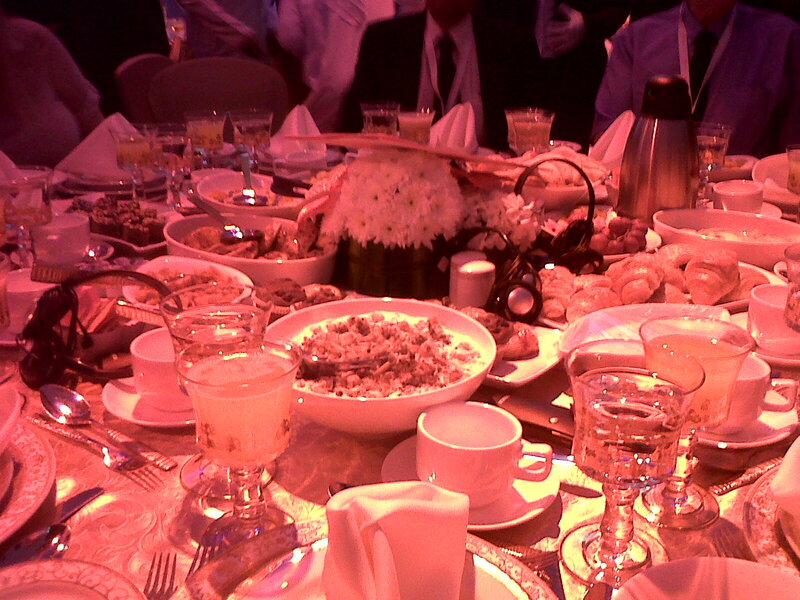 The banquet hall was purpose-built just outside the Fair’s Expo Centre home. On the inside, it had all sorts of bells and whistles. Cameras were everywhere. Some on cranes, some floating about paparazzi style, the images immediately projected onto the walls of the dome – at this point they were showing those of us seated what was happening on the red carpet outside. I almost had a Joan Rivers commentary in my head, almost. 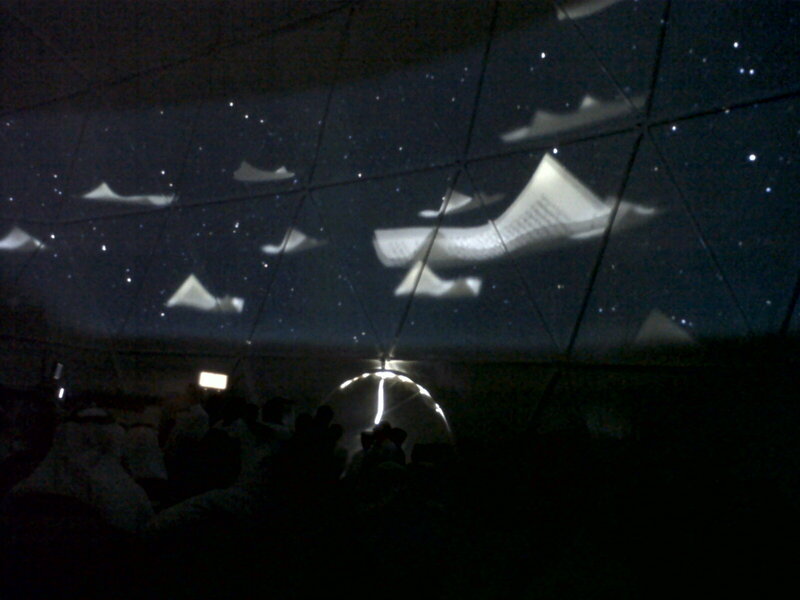 360 video projections were used like video interstitials at The Oscars – this one was of falling sheets of paper which I think showed news headlines about the fair over the years [I could be wrong, they didn’t have subtitles, but it was beautiful either way]. I sat next to a Turkish publisher. We shared many simple silly exchanges [both of us being first time visitors to the region meant our plates were a constant guessing game] and talked a bit about his work. It was fascinating to hear about a publisher’s perspective on the Fair. He’d already sold the Arabic rights to 10 different titles the day before and sees his work as a meeting place of East and West – a long-standing tradition in Istanbul. It was an utterly fascinating experience. What a way to kick off the Fair. If this morning was anything to go by, I’m in for a serious treat. The book you should look at at the festival is Young Americans (Engelhorn) because a) you ARE one by heritage if not by lifestyle, and b) Greg was totally into David Bowie in the 70’s. Keep the details coming! We are all vicariously enjoying your experience. I am indeed an American abroad, and happily mixed up about it in all the right ways. Will keep an eye peeled for the book, have you read it?